Drawbridge, the leading provider of identity resolution solutions, announced today it has partnered with Celtra, the global leader in Creative Management Platforms. 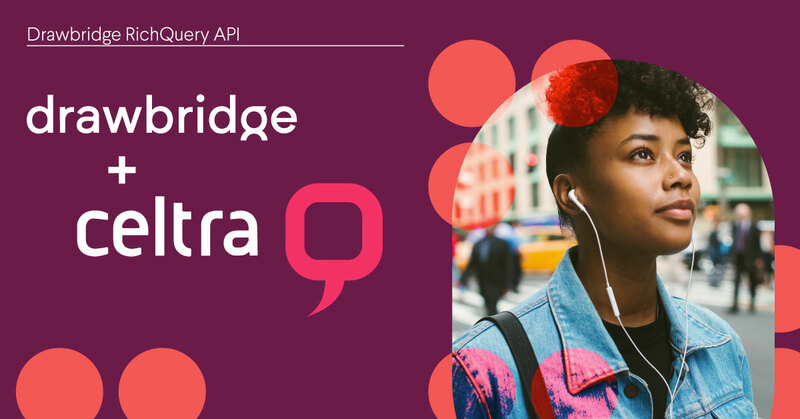 Celtra is the newest user of Drawbridge’s RichQuery API service, giving the company on-demand access to the Drawbridge Identity Graph to supercharge its people-based and DCO capabilities, allowing their brand clients to deliver higher personalization and accuracy of measurement. Celtra is using the RichQuery API to power a long-term strategy focused on enabling scalable creative experimentation and measurement across devices and environments. Celtra’s brand clients will be able to run tests at the person-level, as opposed to cookies or mobile IDs, and then easily scale based on performance. People-based ad experimentation will enable Celtra to reduce “group contamination,” which occurs when a single consumer has been randomized to different groups as they engage with a brand across a number of devices and channels. Not only will this support more accurate measurement and real-time capacity, but ultimately provide a better customer experience. RichQuery API allows Drawbridge clients to identify, understand, and act on new and current customers in an on-demand fashion. Brands and platforms can more easily deliver personalized experiences and messages, and measure conversions across devices as a result of a simple API integration. Today the Drawbridge Identity Graph is available via the Drawbridge Identity Platform or on-demand through its RichQuery API service. For more information, visit www.drawbridge.com. Drawbridge is the leader in identity resolution that helps customer-obsessed companies connect, unify, and supercharge their data to deliver unparalleled experiences with unmatched clarity. Drawbridge uses large-scale AI and machine learning technologies to build democratized solutions for identity to power martech, customer experience, and security applications. Drawbridge is backed by top VCs and strategic investors, including Sequoia Capital, Kleiner Perkins, and Northgate Capital. Find out why wonder, delight, and amazement all start with Drawbridge Identity at www.drawbridge.com. Celtra helps brands make smarter creative and media investments through its cloud-based management platform that produces, manages, tests, and optimizes digital advertising. Celtra’s creative management platform is able to connect the marketer’s content creation with its media buying side of the marketing stack. This consolidation of services establishes new levels of transparency, control, speed, and agility. Enterprises use Celtra to scale big ideas across markets, channels, and screens--with enhanced creative liberty and insight into performance.